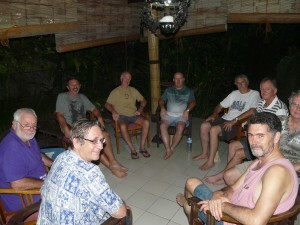 We are just back from our May retreat ‘The Elders Way’ This was our 25th Men in Bali programs. Wes Carter and I had the idea for The Elders Way program when we recognised that there needed to be a space made available for older men to really get some time out aftar ‘retirement’ and take an honest look at ‘whats next ‘ in their lives now that the busy responsible, working part of their life was concluding. We already has the Men in Bali concept under way so it wasn’t difficult to plan in a special program for older men in Bali. What we had not fully realised was how enriching this program would be, both for the participants and for us as facilitators with the privilege of working with men, so deeply dedicated to making the most of the later life. It has continues to be an extraordinary journey! 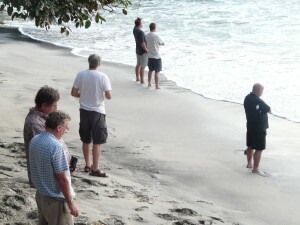 We has 8 men [our limit] for this visit in perfect cool Bali weather, across with days of discovery and adventure. Rich rewards. Here are some pics from the event. 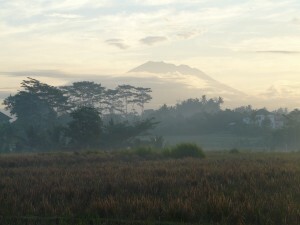 The view of Mt Agung is for real, its just at the bottom of the lane in our village. We do walks, take in a sunrise at the beach, and lots of other adventures along with safe discussion and action group work together.